Solid-state drives not only force out the classic hard drives from the consumer segment but also create internal competition. The smartest NVMe has replaced the SATA interface. Toshiba XG5 is one of these newbies. We understand what is noteworthy mainstream drive with the makings of a flagship. 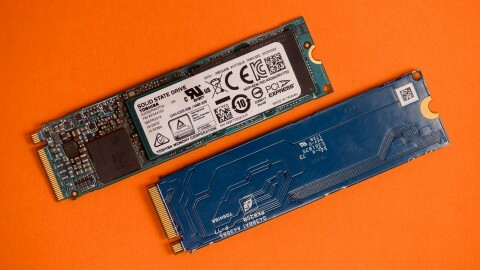 NVMe by itself is a standard for connecting via a PCI-Express bus. The maximum speed of reading and writing drive depends on several factors. In addition to the coincidence of the connector key (determining the operation mode – PCI-Express or SATA III), it is worth considering the number of PCI-E bus lines connected to it. The bandwidth of the connector itself depends on their number (1, 2, 4) – an ultrafast drive may simply be limited by the connection interface and not provide 100% of the possible performance. Toshiba XG5 is a mainstream model based on 64-layer 3D NAND memory. The storage capacity is 256 GB, 512 GB or 1 TB. Externally, the differences between them are not noticeable. However, at the architecture level, the terabyte version is equipped with twice the large buffer size (512 MB against 256 for the “junior”) and the maximum linear recording speed of 2100 MB / s But smaller disks are limited to 1050 MB / s.
Toshiba XG5-P is a modified version of the XG5 with faster read / write speeds, especially in operations with small files. Increased and the maximum capacity of the series – up to 2 TB. The controller of the XG5-P remained the same, but the buffer size LPDDR3-1866 doubled (1 GB for the terabyte model and 2 GB for the two-byte). The speed of sequential reading and writing of the top-end modification reaches impressive values: 3000 and 2200 MB / s, respectively. It is noteworthy that in the production of both lines of drives, the company uses its own production controllers. The speed of writing data depends on the caching algorithm. Simply put, when copying a volume file, the speed will drop as the SLC cache fills. For testing, we chose the older models of the XG5 and XG5-P series, 1 and 2 TB, respectively. Both drives are suitable for being the only disk in the system: with the development of online services, the need for “server” volumes has disappeared, and an external HDD is suitable for long-term storage. At the same time, the “bottleneck” problem is solved in the system – by removing a slow hard drive from the assembly, you will not have to face the constantly occurring downloads of software. As a test bench, a system unit was used in a configuration close to the top one, with additional overclocking of the processor and RAM. This performance margin minimized the effect of other components on the read / write speed. Installation of drives did not deliver problems. All chips of each model Toshiba designers placed on one side of the textolite strip. This arrangement reduces the risk of damage when installing an M.2 SSD in the motherboard – this will be especially true for laptop owners. At the same time, it simplifies cooling – all the “hot” elements look outside and are blown by regular coolers. There are no radiators on the memory chips. When surfing the web and in everyday tasks, the temperature regime will not lead to overheating. But prolonged copying of large files or active use of a database installed on a disk can lead to throttling and a drop in SSD speed. The standard linear reading test in CrystalDiskMark showed compliance with the passport values – the drive was even able to beat them a bit. The subject achieved a good result even in random operations – for any SATA SSD and lower NVMe solutions such speeds are unattainable. However, when copying large files, you should expect a drop in speed during a buffer overflow. The situation is typical for this class of devices – only top solutions managed to get rid of the problem, but they cost twice as much. In the case when the operation is delayed, throttling comes into play as the memory chips heat up, additionally “dropping” performance. Both processes are completely reversible: after cooling and cleaning the cache – with the help of TRIM – the disk returns to the factory speeds. However, such loads are not typical scenarios of everyday use. But when installed in a thin ultrabook or poorly ventilated system case, it is worth considering that the Toshiba XG5 temperature mode is limited to 80 degrees. Exceeding this value will result in a loss of performance. The ATTO Disk Benchmark synthetic test algorithms allow you to puzzle a disk with a variety of files of different sizes, simulating various scenarios for using SSD. The benchmark results demonstrate a steady maximum speed for almost any file size, except the smallest. And this is typical for all solid-state drives. 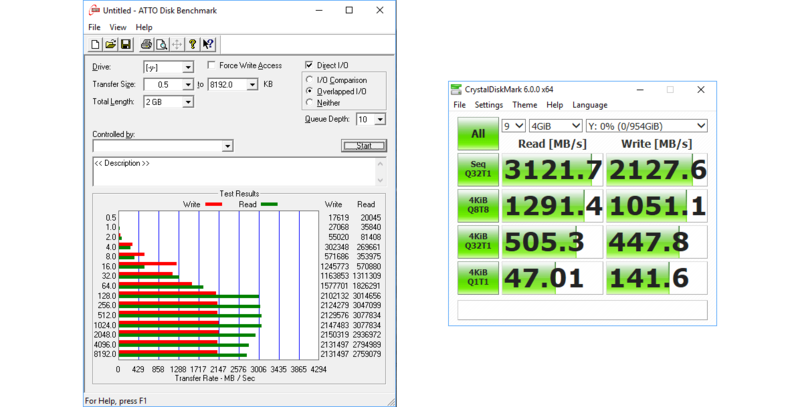 In most typical tasks, the XG5 will give odds to many budget NVMe rivals, and comparing with SATA SSD is out of the question. The speed of the linear operations of the modified drive is slightly higher than that of the basic version — an increase in the size of the buffer and an increase in the density of cells affected. A similar pattern is observed in random write operations. The actual increase can hardly be called noticeable. But when working with demanding applications, such as compilers, the resulting difference in the scope of the project is palpable. A similar picture can be observed in the ATTO Disk Benchmark. A slight superiority over the base model will pay off in the perspective of using SSD for hard tasks. The XG5-P, thanks to the stable speed of working with files of all sizes, even copes with demanding applications. Both Toshiba drives exhibit almost flagship performance in the mid-price segment. The difference between the models lies in the perspective of their application. Junior XG5 is perfect for a home PC or laptop – for every day. The read and write speeds are abundant enough even for demanding games, not to mention office applications and web surfing. Those few scenarios in which there will be a loss of performance are typical for all NVMe SSD, except for the flagships. The disadvantages of the model can be attributed perhaps to the limitation of the volume of 1 TB and the demands on cooling during prolonged loads. The XG5-P, in turn, provides twice the capacity and increased buffer volume. This allows you to use the drive for the most demanding software, without fear of unexpected speed drops. Temperatures XG5 and XG5-P are identical. Therefore, spontaneous overheating is not to be feared, despite the absence of radiators. The transition to NVMe SSD is fully justified if the potential of a laptop or assembly allows you to solve problems more difficult than watching videos on YouTube. When choosing between the two options tested today, it is worth considering only the level of daily load and the maximum amount needed. And both models are able to provide decent performance.